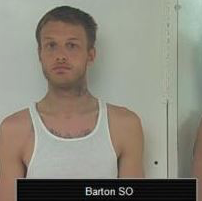 BARTON COUNTY— Law enforcement authorities are investigating two suspects on drug charges. Just after 12:30a.m. Sunday, a Barton County Deputy stopped a 1998 Jeep Cherokee in the 900 block of North US 281 highway, according to Sheriff Brian Bellendir. 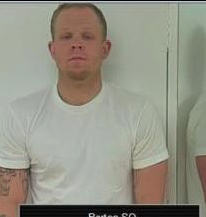 The deputy noted the male passenger in the vehicle was Michael Moore of Great Bend and was wanted on an outstanding warrant from The Kansas Department of Corrections. Moore exited the vehicle and attempted to flee on foot. As he was fleeing Moore was observed to be throwing items to the ground as he ran, according to Bellendir. The items were found to be methamphetamine and drug paraphernalia. The deputy took 27-year-old Moore into custody. He was booked on charges of possession of methamphetamine with intent to distribute, possession of drug paraphernalia, felony obstruction and a no bond warrant from the Kansas Department of Corrections. The deputy also arrested the driver Mark Ray, 30 of Great Bend. Ray was charged with possession of methamphetamine and driving while suspended. Ray posted a $10,000 bond. Moore remains in jail in lieu of a $100,000 bond as well as the no bond warrant from KDOC. On April 7, police arrested Ray, Moore and a woman in connection with a robbery at Dunham Sports in Hutchinson. Ray made a court appearance in the case Friday. Moore skipped the court appearance.